Birding Is Fun! : Holiday Shopping Recommendations from BiF! Your family recently contacted me expressing frustration because you are such a difficult person to shop for. They've asked that I recommend some things that you might be interested in. Out of my abundant generosity and in a concerted effort to preserve family harmony during the holidays I have created a list of some of my favorite birding items. So once you've read this, you might just email your friends and loved ones a link to this post. Have no shame and let them treat you to something nice! It's for the good of everyone. The new Swarovski ATX Spotting Scope is spectacular! A birder with this scope will be the favorite birding companion on all Christmas Bird Counts and "Big" birding events. Get either the 85mm or the 95mm at Eagle Optics ($3,728/$4,078). This is a premium quality scope for the rest of your birding life, so don't be cheap. Plus, you deserve it! You might also want to ask Santa to send it a bit early to have in time for those Christmas Bird Counts that occur before Christmas...I'm just sayin'. I've been testing out this new scope since August and I give it the highest possible rating. This is a must-have book for all people who dare lay hold upon the title of "birder". Not every bird of prey you see soaring in the sky or perched on a power pole is a Red-tailed Hawk. 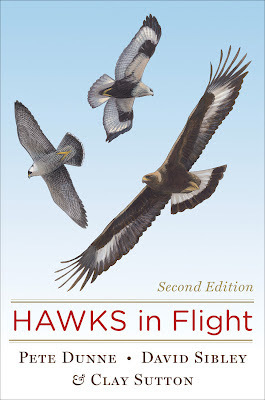 Read this book and study each section and you will become the local expert on hawks and falcons. It is very readable. The tone is such that it makes you feel like you're standing there with the authors as they describe the various hawks and falcons. Their golden nuggets of wisdom are shared in a mentor-like manor rather than forcing you to swim upstream against a current of boring stats. This guide takes advantage of illustrations and photographs, so we get the best of both worlds. I give HAWKS in Flight one of the strongest recommendations I can possibly give. Buy it here online for as little as $14.30. "The Big Year" movie came out on DVD earlier this year. I think it has done even better on DVD than it ever did in theaters. I've had more non-birding friends and family ask me about this movie now that they can get it at their local RedBox. If you haven't seen it yet, its definitely worth watching and purchasing for your personal video collection. I'm seeing that this movie is available online for as little as $9.39. You can buy "previously viewed" DVD's for even less wherever you can find them in a location near you. If there is one birding app that I think every birder should have on their smartphone and that can and should be used daily, it would have to be BirdLog. It makes entering eBird checklists in the field a breeze. As you learn the 4-letter bird codes, you can get so quick at entering sightings that you don't lose any time in your birding. 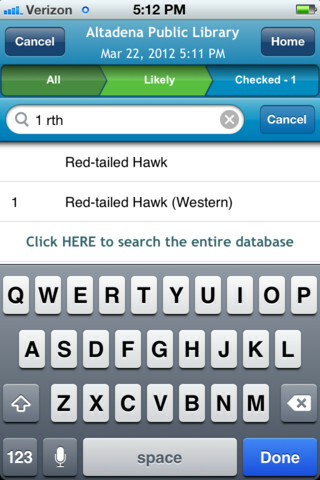 My kids enjoy birding with me when I let them manage the checklist on the BirdLog app. If you're not an eBirder yet, shame on you! - why don't you make it a New Year's resolution to join the wonderful world of citizen science. Make your birding count for something more than personal pleasure. Currently $9.99 in the iTunes store. Ok, so Swarovski's premium products may be out of your current price range, but if you've just got to have a spotting scope sooner than later...May I recommend the Vortex line of scopes including the Razor and the Viper, also available at Eagle Optics. Get the best bang for your buck with great quality scopes from $549 to $1,599. May I also suggest that spending that little additional money on the HD glass will be money well spent. You won't regret it! I added several life birds at the Oregon Coast this past summer with one of these fine scopes. Birder's who want to improve their identification skills and find more personal fulfillment in this pastime should really consider adding sketching or painting to their repertoire. The Laws Guide to Drawing Birds is helping me develope some skills and has reawaken in me a passion for sketching. It has really been a wonderful addition to my enjoyment of birds. This is by far the best do-it-yourself tutorial on drawing birds available anywhere. You can get it online for $16.47. Anyone who loves birds will enjoy this treasury of bird information and images done with the classic National Geographic quality. This really isn't a field guide, nor even a true reference book for birders. It's just a potpourri of great birding stuff and you will absolutely enjoy reading it and perusing its pages! Available online for $24.84. The Swarovski EL Swarovision 8x32's and 10x32's are incredible bionoculars. In the last year I've also been able to try out the 8,5x42's and the 12x50's. All of them are spectacular. While having both the 8,5x42's and the 10x32's in my possession for a couple of months, I found myself automatically reaching for the 10x32's. This surprised me as the 8,5x42's seem to meet that golden ratio for birding binoculars. Perhaps it was the significantly lighter weight of the 10x's that still boast the stunning clarity and quality Swarovski is known for. I'm not really sure, but I love 'em! You just can't go wrong with Swarovski Optiks available at Eagle Optics. The most comprehensive photograph-based birding field guide in North America has been out for a while now, but if you still don't have it in your car or on your shelf, you really ought to have it. I use it regularly when dealing with challenging identifications. The variety of plumages shown is so helpful. I also like the relative sizes discussed in the description of each species. Just $16.49 online! I'm so honored to have this field guide's co-author and lead photographer on the BirdingIsFun.com team as a monthly contributor. Another BirdingIsFun.com contributor has co-authored her first book with her little-known husband...some cat food eatin' guy named Kenn. I'm stewing in jealousy that you lousy New England birders got this awesome field guide first. I demand fully expect that the Kaufman's will create similar regional nature guides for other parts of the continent, so you New Englanders had better buy up all of these books so that they can do more! Hey Kaufmans, let me know how I can contribute to the Kaufman Field Guide to Nature of the Intermountain West. Your next book, right?! Forget all that business about catering to higher population centers first. Sometimes even birders need a break from the more technical books so often used in birding. A nice murder mystery featuring an endearing birder is just the ticket! Each chapter ends with a cliffhanger so be prepared to read this book in just of couple of sittings. You'll laugh at times and be shocked at others. A Murder of Crows by Jan Dunlap is available for purchase online for $14.44. The Kindle edition is $7.95 and FREE for Amazon Prime members! Membership in the American Birding Association is a great gift for any birder. The ABA provides dozens of great services free of charge including the ABA Blog and Birding News, so your support is vital. There are several publications members receive during the year that educate and inspire. There are really exciting ABA events happening all over the ABA area. There's also the Bird of the Year program I'm involved with. Annual membership is $45. 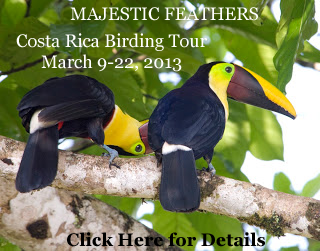 Now, if your family really wants to treat you to something special, something truly amazing and unforgettable, a birding trip to Costa Rica in the Spring of 2013 would be ideal. Let somebody else do all the leg-work planning your destinations, lodging, ground travel, and culinary experiences. Let someone with local experience make sure you have a safe and comfortable time. Somebody that can help you see around 400 species of birds and can give you great photography tips at the same time. That somebody would be my personal friend Kathleen Cameron, proprietor of Majestic Feathers birding tours. Tell her Robert sent ya! None of the products or services listed here are paying me for these endorsements and I have shared this with no obligation. I did receive review copies of the books mentioned here and I'm testing Swarovski products on loan to me. These are my sincere completely biased recommendations shared by my own free will and choice while of able mind and body and not under any form of duress. Happy Holidays! I tried to make it a little more "fun" than typical reviews. Glad you enjoyed it. Thanks for recommending our field guide, Robert. I am pleased to be part of the BIF team! Thanks Lillian! Any word of the possibility of a smartphone app for the Stokes Field Guide?! Thanks for including my latest Bob White Birder Murder Mystery, Robert! I'm keeping this list handy for the birders in my life, and that trip to Costa Rica sounds mighty fine, I have to say. I'm glad you included The Big Year - I recommend it all the time to audiences when I do book talks since it is such a fun introduction to birding. Thanks Jan. Maybe Bob White and a mysterious bird blogger could meet up in Costa Rica for Majestic Feathers birding tour...and the tour company hires a hitman to take out the blogger so that the tour company doesn't have to pay the blogger for the promotional work...and Bob White has to figure it all out. If you've been a good girl and will finally admit to being a "birder" maybe, just maybe Santa will grant your wish. The Laws Guide to Drawing Birds is first on my wish list! Right on! Can't wait to see your drawings! Thanks for creating Birding is Fun! It's been an honor and a pleasure to be part of the team. Fabulous gift suggestions for birders, Robert! I would have a hard time selecting just one of your recommendations. They all are great!